Albert Belleroche original lithograph "Etude"
Medium: original lithograph. 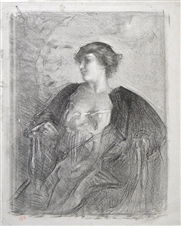 Published in Paris in 1904 by Revue de l'art ancien et moderne. Beautifully printed on china paper, and tipped (mounted along the top edge) by the publisher onto a support sheet. Image size: 9 1/2 x 7 1/4 inches (242 x 185mm). Signed by Albert Belleroche in the stone (not by hand).